It isn’t enough to create these pages quickly. Put thought, effort, and professional services to use in planning, designing, and building them. Keep reading for some of my top tips for what to include on each page. Client-centric messaging. Your website isn’t about you. It’s about your prospective clients. They need your services, which is why they’ve come to your site in the first place. Acknowledge where they are, identify how you can help them, and show them the transformation that could occur in their lives if they choose to work with you. Calls to action. Your website’s homepage is useless if you do not make it painstakingly clear what you want your website visitors to do once they land there. Answers to basic questions. Make it immediately clear what you do, for whom you do it, and where you do it. Prospective clients come to your website with specific questions in mind. 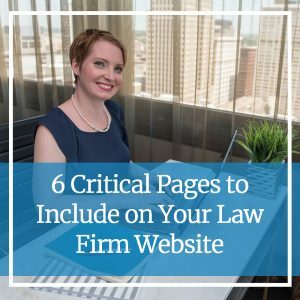 The law firm website that answers those questions effectively wins the prize every time. Your About page is the second-most visited page on your site, after your homepage. Want to keep reading? Visit Lawyerist to read the rest of what Cari has to say here!